This bacon does not have nitrates added during the curing process. Most "uncured" bacons do (look for the asterisk!). Nitrates impart the pink color and the more ham-like bit of the flavor typically associated with bacon. Since this product doesn't have them added it is browner than most bacon and the flavor is slightly different. It's still delicious - we don't know of any pork belly products that aren't - just slightly different than other bacon. Please read the description of regular bacon and "about cured meats" on the right sidebar to learn more. This bacon comes from the belly. We get our pigs to a larger than average size at slaughter, which means their bellies tend to run a bit fatty. If you like your bacon chewy with a healthy amount of fat, this cut is for you. 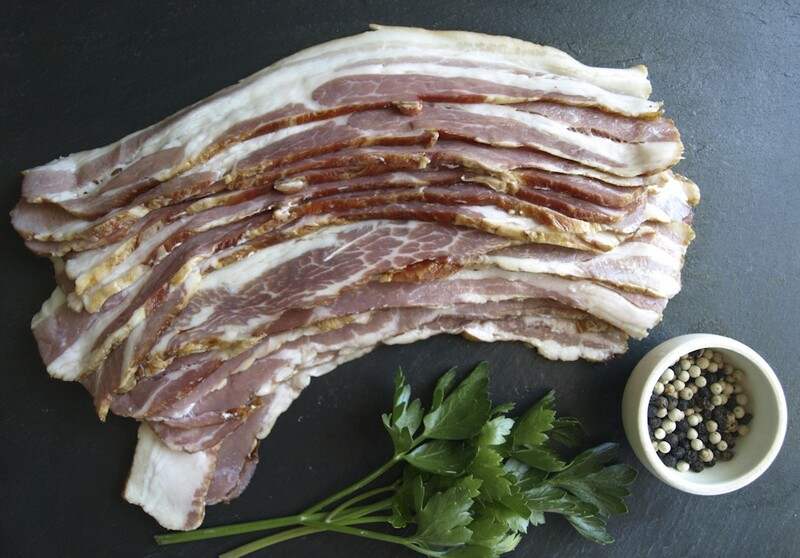 If you want a leaner option try our Country Bacon from the shoulder or for the leanest bacon go with Canadian which is cut from the loin.